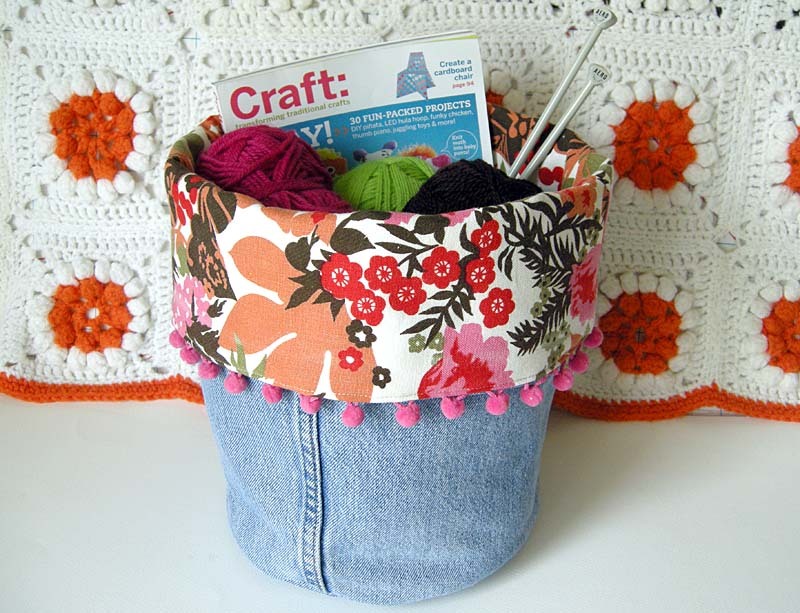 Hop on over to Craftzine today for my tutorial on this fast and fun Denim Do-it-all Bin! If you make “cut-offs” out of old jeans (like I do for my boys) you’re bound to wonder what to do with all of those denim legs laying around. Check it out! I’ve got instructions for large (shown above) medium and small sized bins. I love this idea. I have SO many pairs of old jeans (my friends give them to me, don’t ask!) I am going to make these for Mother’s day. Thanks for the great tutorial. That is cute! Especially love the pom pom fringing – may have to make some for that reason alone! Betz, this is absolutely BRILLIANT! Love it! I have a stash of pant legs I’ve obviously been saving for a reason! So cute! I love the pink balls for trim–that stuff’s my favorite! saw this on their blog yesterday – I’m excited to have a new project for all the jeans in the middle of our upstairs hall that have been grown out of! yep, this is the pattern for me- I love reusing old jeans, and these baskets are so great. Thanks! Awesome! You are a green machine! I gave away all my dismembered legs to a friend who uses the denim in quilting. But I know there will be more in my future. Now I know something to do with them! These are just FABULOUS Betz. Wonderful idea. Muy buena y linda idea. Muy original. Gracias por compartirla. Me la llevo y la hago. This is a very good idea. I think I’m going to try this to. que idea mas original,muchas gracias. Amazing Betz! They are so cool. I am going to make zillions whenever I get old or broken jeans. They are gorgeous. A big hug from sunny Barcelona. What a great idea! I love the addition of the pom pom fringe along the edge, makes them so much fun! Betz what a great idea….Our little group of quilters/sewers/crafters – 5 of us in total, called the Burdekin Plumtree Quilters, [fancy name…huh?] are going to do this as a challenge. We meet each Wednesday at one anothers house and craft away all day. Have yummy snacks and super yummy lunches…you need good food to do good craft…right??? So thank you from all of us. Maybe we could send you a pic or two when we finish! Thanks for the instructions on how to make these fun denim bins!! LOVE!!! came to me … i just make your idea!! Hey! I’ve been a big fan for years and was so thrilled to realized that you, too, are a member of the chaos crew! How great!